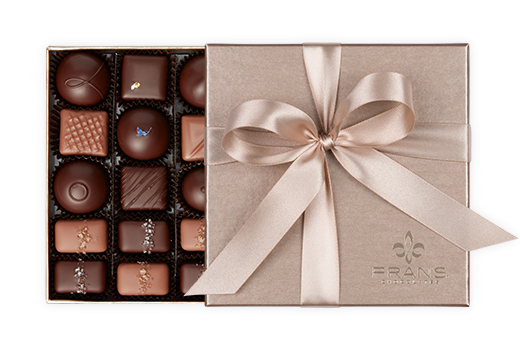 Seasonal assortments of our award-winning Gray & Smoked Salt Caramels and our favorite dark and milk chocolate truffles. 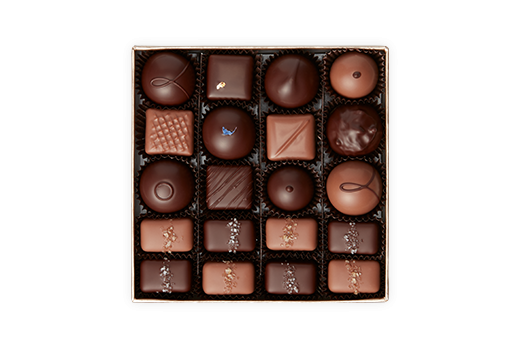 Dark chocolate (cocoa beans, sugar, cocoa butter, soy lecithin, vanilla), milk chocolate (sugar, cocoa butter, full-fat milk powder, cocoa beans, soy lecithin), cream* (milk), cane sugar*+, tapioca syrup*, butter* (sweet cream [milk]), invert sugar, hazelnuts, raspberries, coffee beans, tea, whiskey, orange zest, lemon juice*, salt, vanilla extract*, vanilla beans*, blue cornflowers, gold leaf. *Organic. +Fairtrade. May contain peanuts.